The continuous monitoring program involves measurement of physical and chemical characteristics of water at selected sites using instruments that operate continuously and record data at frequent intervals (e.g., hourly). 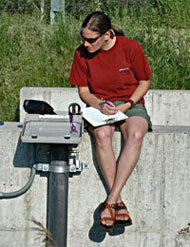 Constituents measured include water temperature, specific conductance, dissolved oxygen, pH, and turbidity. Water quality is measured continuously at seven stations using YSI 6-series environmentalmonitoring systems, including sondes and 650 Multi-parameter Display System (650 MDS) microcomputers. Each sonde measures water temperature, specific conductance, DO, pH, and optical turbidity, and is interfaced with a data logger for on-site data storage. Data are transferred at two-hour intervals to a server, which uploads data in raw form to an FTP site from which performance is monitored on a daily basis. Malfunctions of probes and sensors can be identified through review of trend charts maintained on the World Wide Web site. 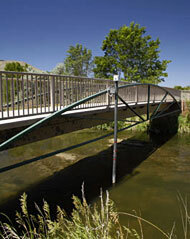 River stage is monitored by USGS at four gauging stations located within the Portneuf Basin. We are measuring river stage at three of the monitoring sites (Portneuf River at Edson Fichter and at Batise Road, Marsh Creek below Walker Creek).In order to maintain this system, technical staff visit the monitoring stations, verify operation of instruments, and replace probes as needed with freshly-calibrated units.